"In my opinion, this is by far the strongest of Robin Clay's books. It is pretty much current (frequently referencing Jellyfish 2.1 evaluations and rollouts and Sconyers database equities) and generally presents reasonable alternatives modern players might consider and gives a fair comparison of them. My main criticism is that his treatment of cube handling is weak. Clay claims that cube decisions should be made on three criteria: race, position, and threat  personally I think that's horribly overgeneralised. 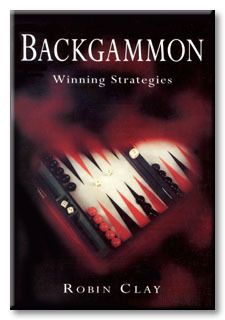 COVER: Backgammon Winning Strategies is for the player with a basic knowledge of the game who wants to improve their skills and enjoy the taste of victory. The book introduces a new and entertaining way of testing one's judgement by asking the reader to try their skill against common playing situations with analysis of both the correct decisions and the more misguided. Backgammon Winning Strategies sets out the most up-to-date principles and concepts of a game that has changed a great deal over the last decade. The self-scoring quiz ensures that the reader has learnt the principles correctly and, as importantly, allows the reader to learn through their mistakes by explaining why a move is wrong. The opening, middle game and the end game race, as well as the arithmetic of probability are all dealt with in a clear and instructional way, ensuring that one can arrive at the next game confident of victory. AUTHOR: Robin Clay is an experienced player, ranked no. 4 in the UK, who lectures on backgammon skills and strategy.